Click the image for a full page printable flyer (JPG). 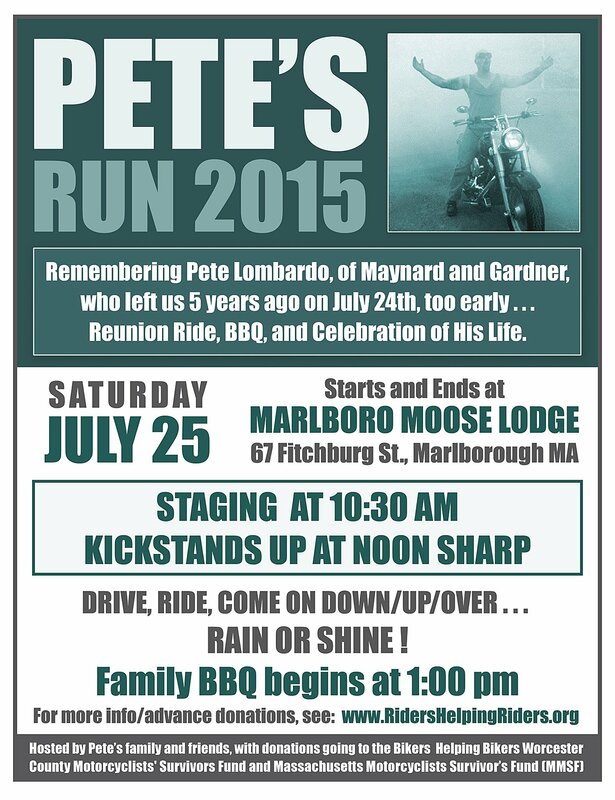 Pete’s Ride and BBQ: Remembering Pete Lombardo, of Maynard and Gardner, who left us 5 years ago on July 24th, too early . . . reunion Ride, BBQ, and celebration of his life hosted by his family and friends, with donations going to the Bikers Helping Bikers Worcester County Motorcyclists’ Survivors Fund and Massachusetts Motorcyclists Survivor’s Fund (MMSF). Staging begins at 10:30 a.m., Ride leaves at Noon Sharp – Family BBQ begins at 1:00 . . . drive, ride, come on down/up/over . . . rain or shine ! Want to donate in advance of the ride via your debit / credit card, or, if you can’t make the ride? You can make a donation in Pete’s memory to benefit Bikers Helping Bikers Worcester County and Massachusetts Motorcyclists Survivor’s Funds. This entry was posted in Events and tagged events, marlborough, mmsf, pete lombardo, wcmsfund on June 29, 2015 by mmsf.